For the 11th consecutive year, Queens Crossing and F&T Group are bringing to downtown Flushing, a creative Christmas art installation with the goal of getting the community into the holiday spirit and bringing unity amongst all. The annual unveiling has become a renowned tradition for those that live and work in the area, and for many represents a kick-off to the holiday season. This winter, the selection committee has chosen young Taiwanese artist James Hsieh to design and create an eye-catching Christmas installation to make this holiday season fun and joyful. fascination with the extraterrestrial and the prospect of intelligent life elsewhere in the universe. He designed this art piece with a large-scale pentagram star which symbolizes the Christmas spirit made by plaid wood, plexiglass, LED light and other innovative materials on one side. Various alien species can be seen lurking around the side and on the platform itself. Each alien creature is hand-painted by the artist bringing more galactic fun to the art piece. “New York City is one of the most culturally diverse cities in the world, the immigrants and the ‘Aliens’ from all over the world, including myself, bring different vibrant ‘Colors’ and energies to the Big Apple. In addition to conveying the joyful holiday vibes by the pentagram star, the concept of alien invasion and the vivid colors also represent the ethnic diversity of the city,” said James Hsieh. 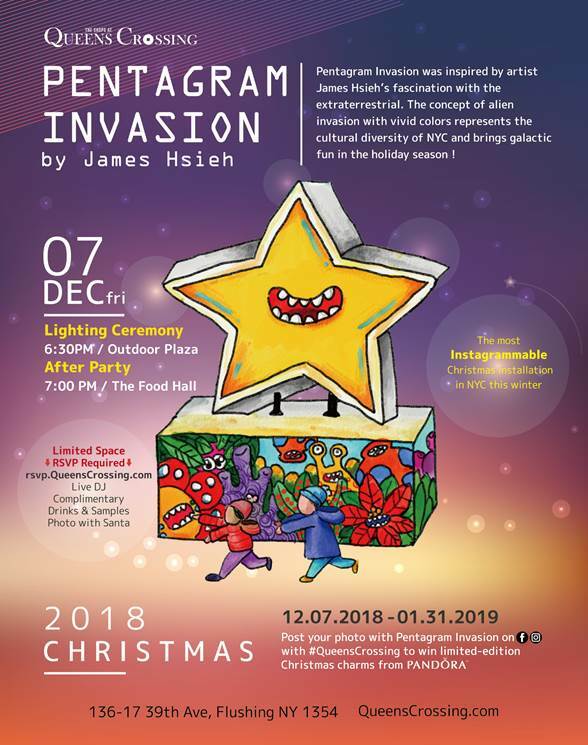 As the chief designer of one of the most “instagrammable” interactive exhibitions, Wonder World, in NYC earlier this summer, Hsieh wants to make the “Pentagram Invasion” the most popular Christmas installation on social media this winter. “Taking photos deemed ‘instagrammable’ is a current trend for millennials so we wanted to create something fun and eye-catching this year that would look great in person and in photos. Visitors are encouraged to post their photos with the installation and tag us on social media,” comments Wesley Sin, curator and marketing manager of F&T Group. On December 7th, the organizers invite the community at large to take part in their annual lighting ceremony celebrating Hsieh’s creation. Anticipated participants include Queens Borough President Melinda Katz, New York State Senator Toby Ann Stavisky, New York State Assemblyman Ron Kim, New York State Assemblywoman Nily Rozic, New York City Councilman Peter Koo, Miss New York USA 2018 Genesis Suero and Miss New York Teen USA 2018 Saige Guerin. There will also be a live performance by award-winning dance groups, AKF & L2A. An after-party will be held immediately following the lighting ceremony at the Food Hall at Queens Crossing to celebrate the opening of new stores. This hip and trendy eatery is now offering 10 individual food vendors with new concepts. In addition to existing brands such as Paris Baguette, OK Lah, Kung-Fu Tea, Happy Lemon, Ajisen Ramen, Old Street Dimsum, Wonjo Tofu House, three new eateries will open their business on December 7th, including Lin Lin & Leong Taiwanese Cuisine, Lil’ Banh Mi-Vant Vietnamese Sandwiches and Spice Bowl Sichuan style skewers. The after-party with complimentary drinks and samples is by RSVP only at rsvp.QueensCrossing.com. Visitors can post their photos of the installation with the hashtag #QueensCrossing on multiple social media platforms (Facebook, Instagram, WeChat) from December 7th to January 31st, 2019 and get the chance to win limited-edition Christmas charms from Pandora Jewelry. No user commented in " Queens Crossing 2018 Christmas Art Installation "